Professor Richard Thaler of the University of Chicago has been honored with the 2017 Nobel Memorial Prize in Economic Sciences. For 200 years, economists have argued (and continue to argue) that humans are rational. Economists would probably be the first to accept that the assumption is far from being perfect. The holy grail of rationality is so deeply embedded in economic theory that any alternative is looked down upon. Professor Thaler is the proponent of behavioral economics – a branch of economics that studies human behavior without making lofty assumptions. Professor Thaler’s basic argument is that humans are not rational. The argument that humans are not rational by itself is not profound. The practical usefulness of the argument is that certain types of irrationality can be predicted. The predictability of certain types of irrational behavior has significant implications for everything from individual happiness to public policy. From an economic perspective, this does not make any sense. Why can’t Mr. and Mrs. J use part of their savings to pay cash and buy the car? After all, the interest on the car loan is higher than the earnings on the saving. Rational behavior would suggest that the couple would be better off paying $11,000 in cash and setting aside what they would be paying as the monthly installment on the loan toward their vacation home. A simple calculation will show you this is the better of the two options. In Professor Thaler’s view, this is not how we make decisions. We tend to make economic decisions by budgeting certain amounts of money for certain purposes. In other words, the $15,000 in savings is not just $15,000. It is the money set aside for the vacation home down payment. Using the amount (or a part of it) to buy a car amounts to pilferage (in our minds). The behavioral part of the decision stems from the fact that we are conscious of our limits at self-control. We are more confident in our discipline to pay the monthly installment on the loan (otherwise the bank will take away the car) than in our willingness to save a certain amount month after month. This has important implications for analyzing people’s behavior. Let us start with a simple example. Assume that gasoline prices go down. Rationality would say that people would use the resulting saving to buy something more important than gasoline. In one experiment after another, researchers have shown that people switch to premium gasoline even though there is no evidence to suggest that premium gasoline is good for your car. Thus, we have in our minds what may be called “gasoline money” and we are unlikely to spend it on anything else. 1. Suppose the vehicle registration department sends out letters to car owners reminding them that the due date for making the next payment is approaching. The response is nothing to write home about. Include a picture of the car in the letter. The response goes up dramatically. Why? 2. Reminders sent for paying a municipal tax evoke practically no response. Just include a statistic – 90% of the people have already paid the tax in your community (or zip code). The rest promptly respond with the payment. Why? 3. Appeals for organ donation typically go unnoticed. It is amazing to see one country with a 28% volunteer rate and a very similar neighboring country having a 100% volunteer rate. The answer is in the wording of the appeal. In countries with low rates, you are required to check a box to “opt-in” if you wish to be a donor. Most people do nothing. In countries with high rates, you are required to check a box if you wish to “opt-out” of organ donation. Most people overlook to check this box as well! A second aspect of Professor Thaler’s work is referred to as the endowment effect. In simple terms, we are more sensitive to incurring losses than we are to feeling good about gains. For example, assume that you have been to a place where a new virus has been detected and if the disease is contracted, painless death is certain within a week. The probability of your having the disease is 0.1%. What would you be willing to pay for a cure? Tweak the above example a little. Volunteers are required for research to find a cure. You would be required to expose yourself to a 0.1% chance of contracting the disease. What is the minimum amount you would require to volunteer for the program? (you cannot purchase the cure). Through the prism of classical economics, the answer to both questions should be the same. Professor Thaler proves the assumption to be wrong – by a long shot. He has found that while people were willing to pay $200 for a cure, they would demand $10,000 to participate in the study. The endowment effect is so powerful that people are willing to pay 50 times more to preserve their current level of health than to get a little healthier. The endowment effect is useful in explaining why retail outlets cannot suddenly increase the price of umbrellas in a thunderstorm, why concert organizers cannot increase prices significantly even when the demand is high, and why a car dealer who expects a premium of $200 for a car that has a long waiting list is viewed as more unfair than a car dealer who traditionally gives a $200 discount but merely withdraws the discount when there is a waiting line. Think about it. If a dealer has been selling a car at list price and increases the price by $200 to cope with demand, people find that unfair. If the dealer has been selling at a $200 discount and stops the discount to cope with demand, people are fine with it. How do you explain this anamoly? Perhaps the most important implication of Professor Thaler’s work can be found in retirement savings. The “Save More Tomorrow” concept has had a profound effect on savings. When people are asked to save more (affecting their take-home earnings) they resist. The same people, when told that a small portion of their raise would be transferred to a retirement account, are fine with it. In other words, by merely relating increased savings to increased pay (thus never resulting in a lower take-home earnings) people willingly cooperate. 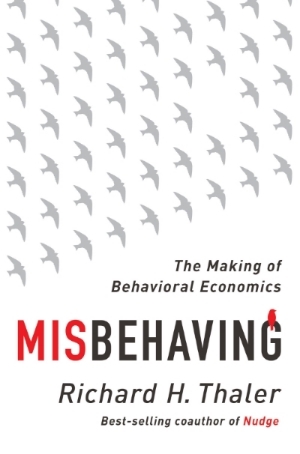 For more on Professor Thaler’s work, please read his books: Nudge, The Winner’s Curse, and Misbehaving.